Recently while shopping at Texas Art Supply with my husband for some supplies for one of his creative engineering projects, I fell a little bit in love. And at that moment, it actually wasn’t with my husband – that’s well traveled ground already – but with this book. 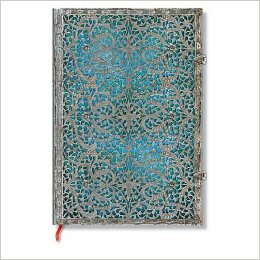 To be specific, it’s the Paperblanks Silver Filigree Journal in Maya Blue, Grande size (meaning slightly larger than the dimensions of a full sheet of printer paper). It costs more than a typical hardbound book, but then it’s bigger and prettier and filled with 240 unlined pages. Paperblanks has an utterly gorgeous series of blank books whose covers are like the twelve dancing princesses – each more beautiful than the last. I adore blank books. Sometimes people who are a lot younger than I am will look at me funny when I say that I still write by hand. I don’t do this exclusively, of course. I can and do compose on a computer on a regular basis, although I have not always done that. But I love the flexibility that a blank book, which I can fit into my purse or satchel, gives me. A blank book requires no power source or adapter or electrical outlet or battery. It does not become difficult or impossible to read in sunlight. It does not have to boot up or go through a long shut-down process. It cannot accidentally delete what I’ve just written. It will not contract some weird virus that surreptitiously begins emailing everyone in my address book random passages from my unpublished manuscripts. Don’t get me wrong – I love working on a computer, too. It’s marvelous for editing and for research. I would never advocate a return to handwritten manuscripts (the origin of the word) or even using a typewriter. And I do actually spend a lot of time drafting on my machine. In fact, I’m writing this post from the bakery/café where Sarah and I have brought our laptops to for our weekly writing date. But the thing I carry around with me, for jotting down ideas, for freewriting, for working out problems and showing my work rather than trusting the whole thought process to reside in my head, for outlining and brainstorming, for drafting a scene – that is a blank book. 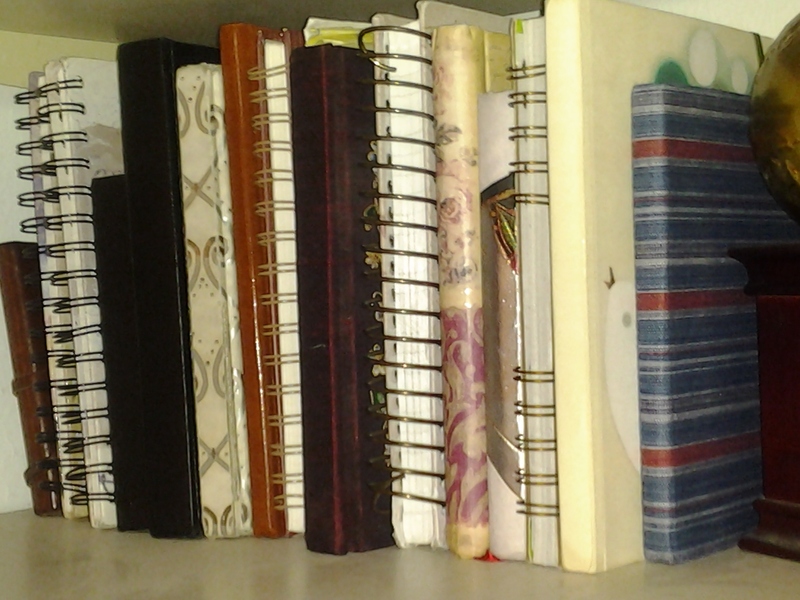 my collection of blank books. I already have the wall of bookshelves, and one small section of one bookshelf is devoted to my own publications. It’s a slowly growing list of books, mostly anthologies in which my work has appeared, that represents a lot of hard work and the ambition of decades. To publish – not to be famous, but to be known – to be understood – it’s the subject for another post some time. But it’s strong and foundational and has been with me since my childhood. Also on that bookshelf is my collection of blank books. Not the ones waiting to be used, but the ones I’ve already filled – at least the ones I’ve had since college, when the idea of a laptop was an unreasonable extravagance because I had a perfectly good desktop machine in my dorm room, and more days than not found me writing poems under an oak tree, away from my roommate and her saccharine music or television, feeding squirrels stale saltines from the cafeteria in the thoughtful spaces between the lines. Those books contain the notes I took in my Creative Writing classes, the commentary of workshops of my manuscripts, everything I ever wanted to know about the various types of slant rhyme, highlights from writing conferences I’ve attended, quotes from the published authors who visited campus for Q&A with the CW grad students, the anguished diary entry of my most embarrassing moment – when I tripped up a flight of stairs next to the stage in a crowded lecture hall during a Q&A with David Foster Wallace. They contain notes scribbled in the margins from my classmates and the phone number of some boy who was trying to ask me out on a date during a particularly dull class conducted by a particularly bombastic professor. Every entry dated, they demonstrate in painful void the long stretches of time when I denied my artistic side, when I tried so hard to have just one career, and the months during which I suffered from pregnancy-induced carpal tunnel, and the times when I couldn’t find the energy to use a blank book because my days were spent caring for my children when they were babies and toddlers. Those books are filled with the revision process, with the outlines of short stories that haven’t been written, with the minutes of my writers’ group’s discussions of my first two novels, with the details of meetings I’ve had with literary agents and phone conversations with editors. Those books bear witness to the evolving history of my life as a writer. Computer files – useful and cherished and over-protected in back-ups as they are – can never compete for ambience with the fractured spines and softened pages and ink blots of these old journals. Blank book love. It’s a thing. Blank book Love. It is a thing! I agree. Blank books make lovely dream journals too. They certainly do. I kept one for a while when I was finishing my degree in poetry and experimenting with surrealism. Most helpful tool ever. A blank book deserves a fountain pen. Especially a blank book with thick and creamy pages, yes. Such a timely post! Bridget Jones’ Diary is on my annual holiday playlist, so I’ve had my blank books on the brain this week. I’d try to organize them, but the entries of the last few years are scattered in a handful of books stashed throughout my house. There is a hierarchy to them, though, don’t you think? In the sea of black Moleskine® at conferences and seminars, there are no spirals to be found, and my gilt hardback seems almost shallow. Nowadays I switch between black for work and gilt for dreaming. I know a lot of people who have a system like yours. I’m so rigid about order, I mix all kinds of things together and keep them organized by date. However, I find this can be difficult when trying to go back to find notes for a particular project (since I never have just one going at a time). I’m considering switching this method and using particular books for particular projects instead. But when to start? Perhaps when I finish the current book? And then, of course, I’ll be in the middle of things with my projects, so no book will actually have all the notes for a project… Oh, such a conundrum…which is why I haven’t started doing it this way before now.